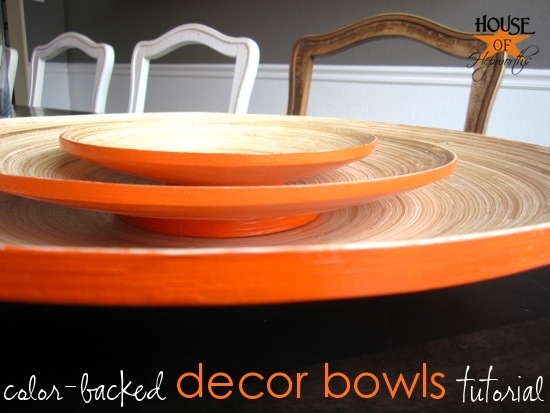 The response I received from the Orange Color-Backed Bowls was greater than I anticipated. I’m glad you liked it! I received lots of feedback asking how I hung them on the wall. Great question! Because of the concern with bamboo I decided to use hot glue and a paperclip. Yes, I said hot glue and a paperclip. I felt confident the hot glue would really stick well to the bamboo. I got a large paper clip and bent the top just a little to angle away from the bowl. I set it onto the bowl and then just added a ridiculous amount of hot glue on top of it leaving the very tip of the paper clip exposed. 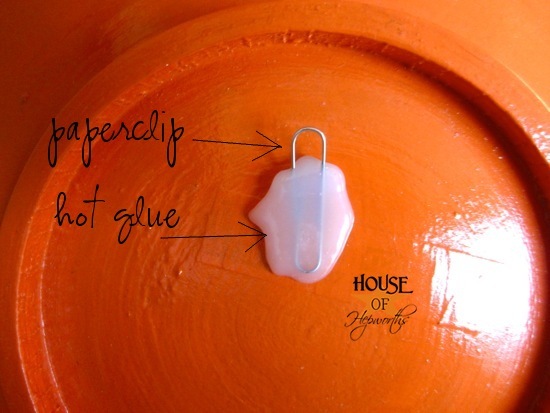 When the glue dried I hooked the paperclip to a nail on the wall. Easy peasy and FREE! 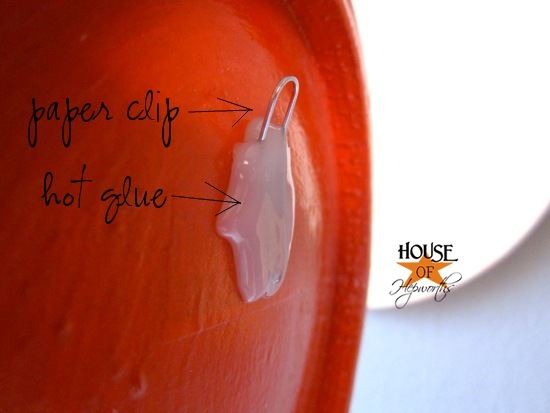 * I would NEVER use this hot glue and paper clip technique to hang expensive or fragile plates. My friend hung porcelain plates (aka heavier than bamboo!) on her wall with hot glue and paper clips and over time the plate fell off the wall and broke. This technique works great for non-fragile items that are light weight. If I’m hanging something fragile or heavier I always use DiscHangers. So there you have it! 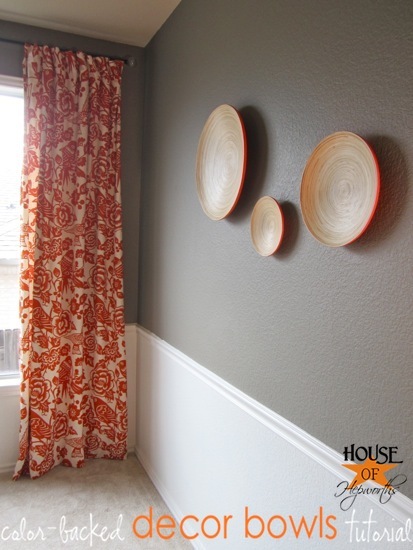 You can see how I painted the bowls here. I’ve dome something similar with the tabs off of soda cans when I hung some small mirrors around my daughter’s room. so neat, nothing simple like that ever comes to me, I would have been looking for something in store forever to use. Really handy tip, thanks for sharing. I love the pop of colour that the orange makes on your walls, Really funky. What an awesome idea!! An epoxy would probably make it a little more long lasting. My husband makes fun of my hot glue obsession and always goes to his stand by epoxy instead. A light sanding on the surface helps the glue or epoxy adhere better, too. 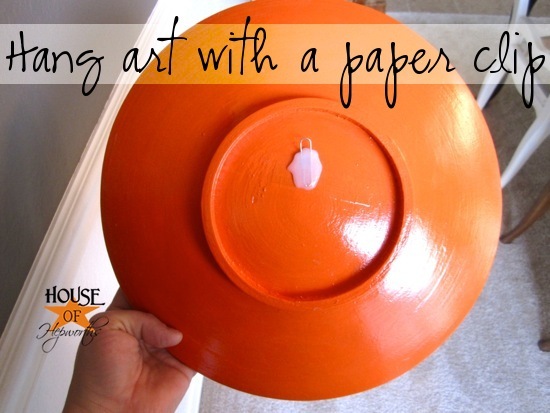 I’m totally doing this with some plates I got yesterday. You are genius!